The Eagle - A large and powerful bird. Strong and masterful. These are some of the characteristics that Nazanin was inspired by for her latest design. Inspired by the spirit of the bird, its symbolism in cultures and its commanding presence have been captured to create a genuinely breathtaking ring. 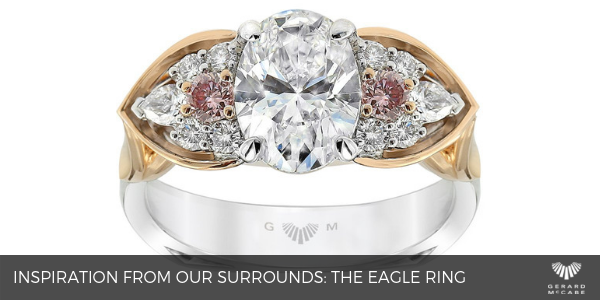 Representing the essence of the Eagle through every detail, each piece of this ring represents the elegance and grandeur of these impressive birds. The central oval cut diamond, at more than 1.5ct, truly glistens and is further complemented by the pink diamonds that sit either side. The rose gold undercarriage and fine detail within, along with the collection of white diamonds, create a ring that is mesmerising from every angle. Delicate curves are used to embody the characteristics of the Eagle and reflect Nazanin’s impeccable eye for detail. The combination of white and rose gold only further enhance the play of colour that this ring radiates. 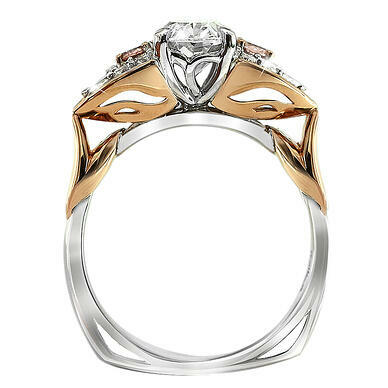 The Eagle Ring is only one of Gerard McCabe’s pieces that Nazanin has designed. Her ability to transform thought and wonder into tangible creations has meant our stores are filled with unique and breathtaking diamond jewellery. Nazanin enjoys taking a thought or gemstone from a customer and creating beautiful masterpieces, like the Eagle Ring. These Bespoke Consultations are available to anyone, and you can book a consult via our website. You’ll have the chance to sit down with Nazanin and bring to life what you’ve always wanted. It’s an opportunity to create a piece of unique jewellery and work with an award-winning jewellery designer. Nazanin was recently recognised for her outstanding abilities in the Australian Jewellery Design Awards, winning two awards for our Echunga collection and Trinity Rose Engagement Ring. These awards alone are a testament to her ability to create works of art that extend beyond metal and gemstones. Discover this ring, and other Bespoke collections, at our Adelaide and Melbourne jewellery boutiques. 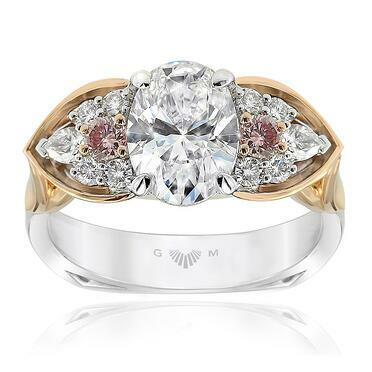 Gerard McCabe Jewellers are the specialists in diamond engagement rings and wedding rings in Adelaide & Melbourne. We create beautiful ladies wedding rings, men’s wedding rings, classic engagement rings and dress ring designs. We can create bespoke tailored rings to fit your specifications. So pop into one of our jewellery stores in Adelaide or Melbourne for your dream ring consultation.